We recently told you that Installous has been updated to version 4.0. This new Installous 4 version is crashing for many users and they can't use it effectively on their iDevices. Besides crashing some users also notified us about the Installous 4 problem with the backgrounder app on their iDevices. But what to do if Installous 4 keeps crashing? Read the tutorial below to fix Installous 4 crashes on your iDevices. We have also devised out methods to fix Fileape and Mediafire, Installous search button and API error crashes and make Installous 4 work again. 2) Delete the file Searchviewcontroller.nib. Now, Installous search button will not crash and work perfectly after this. 2) Search for the file Installous. 3) Click the blue arrow for the first file. 4) Go down to access permissions. 5) Remove the Sticky (setuid) bit from User, Group and General, if set. 1) Repeat steps 3) to 6) for the file "Installous_". 2) Close iFile and run Installous 4. Uninstall Safari Download Plugin and reinstall Installous 4. Now you will be able to download apps from Fileape and Mediafire again. 1) Uninstall Appsync and Installous 4.x. 3) Install the correct AppSync. 4) Install latest version of Installous 4 from our repo. 5) Open the real App Store and install a FREE app. 6) Open Installous 4 and start downloading and installing apps without any API error..
Another way to fix many bugs and issues is to update Installous 4 to the latest version available. You can download the latest version of Installous 4 from Mod Your Pod repo as shown below. If you are facing any crashes and errors in Cydia after jailbreak, follow this guide. Please don't forget to tell us how Installous 4 is working now. If you have any other errors and issues report them to us in the comments section below. If you have any other fix for fixing Installous 4 crashing notify us. 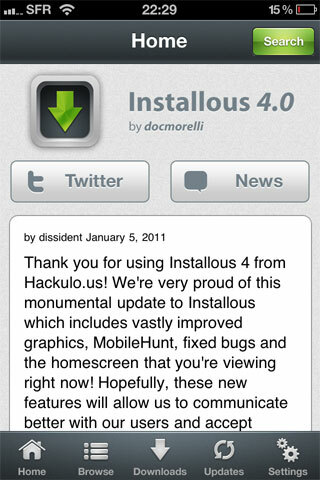 Installous4 has updated to version 4.0.0.7 by Hackulo. Your method 1&2 were failed for MobileHunt. This problem issue (native mode) was incompatible with Backgrounder. Until now, it still crashes on "Update". We are taking up your issues and seeing for a potential fix to it. So, please wait for the tutorial to be updated. Ok thanks for reporting this to us, and please use your name so we can give the credit to you. Thanks your method has been added to the above post. cydia wont let me download unless i un-install installous 4 first-whats going on there? If you still face any issues please feel free to ask us. hi, i uninstalled safari download plugin, then uninstalled installous, then tryed to redownload installous and it wont work.Nothing shows up on screen after i donwload form cydia. Great piece of information guys. I have and use safari download plugin. for those who have SB settings you can toggle the plugin off when using installous 4. This is as effective as removing it. so when i need to dload from safari i toggle it back on. Thank you, thank you, thank you. After months of not being able to use Installous to download, method #4 worked like a charms for me! Number 4 works great.Thanks a lot!!! Hey I am running an iPod Touch 4th gen with 4.2.1 firmware and my installous can download apps but when I go to install them, they just keep installing forever. After a while i just went to the home screen and the app was there but as soon as i opened it, the app crashed. any help? #4 worked perfectly for me. I knew that the problem was caused by something that dTunes installed as dependence. Thanks for sharing it, Washokusan. Number 4 worked great for me, thanks guys. i removed safari dl installed the latest version of installous and reinstalled it but fileape still wont work. Whn i try to download from it, it just blanks out and theres is only white on the screen. Download plugin installed. And you say go to Ifile where will I find ifile. I had similar problems but by using the source http://cydia.myrepospace.com/ModYourPod/ suggested earlier, it solved the problem. (maybe add the source to the initial post so its easier to find?) Reinstall installous 4 from that. Looks like it has all the issues fixed. I would try that matt. Hello Matt, iFile will be shortly available on Mod Your Pod Repo. Thanks for your patience. 1. Cydia says it cant find your repo? I would appreciate any assistance, thank you. You should also update to the latest version of Cydia. If the problem persists, feel free to report you errors to us. reinstalled Installous through your repo. Worked perfectly afterward. It should be noted that the version of Installous that was giving me trouble had a green "settings" button in place of the green "search" button at the upper right. Weird. I don't have backgrounder available for my 3GS and I didnt need to chamge the file permissions to those files. I found them to already not have the Sticky attrib set. Installous 4 the latest allows me to search an app but as I select it, Installous bombs out. Any takers, thanks in advance!! Hi there, same problem as matt with iTouch 3g v 3.1.3: crashes as soon as you try to open the Download window. Removed Backgrounder, which i don't use, but no result. So I tried downloading installous from ModMyPod repository, but the instaler kept saying there were already things with same names. So I removed installous an retried. All worked fine. It should be noted that the version of Installous that was giving me trouble had a green "settings" button in place of the green "search" button at the upper right. any idea how to fix this?? A common solution to all the above problems is to download the latest version of Installous that is Installous 4.2 .deb from our Mod Your Pod Repo. I used the new source. Can you specify which one? The one which is above your comment. cydia japanese,Safari Download Manager 1.5.1-1 Cracked, Infinidock 1.7-1 Cracked,iFile 1.3.2-2 Cracked or iKeyHoleTV(Fix)? Uninstall installous with Cydia and remove Installous directory from applications. Reboot and install Installous again from hackulo repo. Ursuline work fine this time. For anyone who is having problem adding our Repo in Cydia. Paste this link in the address bar of your browser, and it will automatically download Installous 4.2 .deb. my browser doesn't show the download.help! download in iphone or pc? But pc never show the download. It jump into www.myrepospace.com only. Even i registered as a member it never shown. Make sure you have downloaded Installous 4.2 .deb from our repo. If the problem still persists after trying the above methods, wait for the next release of Installous , which will be very soon. Any updates on the new release? I've worked through everything listed here. Cydia always shows an update for Installous now and Installous still crashes when I touch the Search button. Hi, i have an iphone4 4.1 and i downloaded installous4. The Search button make the app crash all the time! I did the 3 first method above! No one seem working with me! Can someone help me please? All those who are having Search button crashes in Installous 4.2 please wait for the next version. As this problem will fixed in the updated Installous. Thanks a lot for appreciation. The next version of Installous will be out in a very short time. We will notify you as soon as possible. Please add our Cydia source also for Installous and other cracked apps. You can get latest full version of iFile on Mod Your Pod Cydia Repo. You can fix this issue by downloading Installous 4.2 version. after i added that source in method #5 i got an "Error:Database Malformed line 2 in source list/etc/apt/sources.list.d/cydia.list (distparse)"
what do i do now??????? How can i uninstall the Safari plug-in?Am kinda new at this..I have an I phone 4 with the new installous. well, method 1 worked...but here's the thing...mine keep crashing when im on mediafire. what i did was opposite, instead of unchecking the "sticky" which was already uncheck in installous version 4.4, i checked at all 3 (User, Group and General). and it worked fine. If my PC crashes, will it also cause my SD card and external hard drive to crash? Hi, thanks it's been great so far but there is no Application/installous.app when I open application in IFile and it is not that I don't have Installous! You are doing it wrong. It is "Applications". Every word has to be the same. MY INSTALLOUS STILL CANT OPEN FILEAPE.COM. MY CYDIA CANT FIND SAFARI DOWNLOAD PLUGIN ETHIER. HELP. I am not able to download from mediafire. When I searched for the safari download plugin in Cydia it shows that it isn't installed. What should I do. It still works fine for zshare. A new Installous version will be released very soon. We hope you can wait for that till we make out a potential fix for your problem. Please we request everyone to stay patient as we are making a mega guide to fix every Installous error. Thanks. Number 5 did not work for me. I don't have the safari download plugin. I removed Installous, rebooted, downloaded latest Installous from the repo posted here. Dame results, blank screen from Apefile. Any other tricks I could try? @Bordel :We are soon preparing a mega article on fixing every Installous crashes and errors and it's currently under works. I hope you could wait for that. Hi Please try the following.. hope it helps..
wait for a while to see all the available service providers just below 'Automatic' function, then choose ur﻿ service provider manually.. e.g. AT&T, T-Mobile, SingTel, StarHub,etc.. then **'REBOOT'**(//##important##//­)..
if you think your service provider's 3G is not powerful enough, please try to install 'My3G Cracked' from SinfuliPhone.. It makes ur iphone thinks 3G as WiFi.. hv fun.. Please try the following.. hope it helps..
wait for a while to see all the available service providers just below ‘Automatic’ function, then choose ur﻿ service provider manually.. e.g. AT&T, T-Mobile, SingTel, StarHub,etc.. then **’REBOOT’**(//##important##//*).. NOTE (important) : you may still need to switch between ‘Automatic’ and ‘Manual’ carrier mode since you may still encounter the same issue while you are in ‘Manual’ carrier mode. Just switch them vice versa..
if you think your service provider’s 3G is not powerful enough, please try to install ‘My3G Cracked’ from SinfuliPhone.. It makes ur iphone thinks 3G as WiFi.. hv fun..
when i uninstalled the download plugin and reinstall installous it still doesnt download from fileape?? help!!!!!! That's the only fix for this problem, but it doesn't work for you. Wait for an installous update soon. Hi. I am running 4.2.1 firmware on a second generation ipod touch. I have found that I can't download games from installous. What I mean by this is that when I download anything other than a game, it works fine, but when I download a game, i try and open it from my springboard and it opens for a few seconds to one of the sponsors that apps normally have and either stays at that screen and doesn't leave or opens to a sponsor screen and then closes. I have tried getting both Plants vs. Zombies and Call of Mini: Zombies from installous and neither will work. Plants vs. Zombies gets stuck at the popcap screen and freezes, to get out of it I have to hit the home button. Call of Mini: Zombies gets to the Triniti Interactive screen and then crashes. If anyone could help fix this problem it would be greatly appreciated because the main reason i got installous was for games. Hi, sry my english, but i have a 3gs 8gb 4.3.3 jb by redsn0w, and have installed installous4 and appsync just the way it shoud be, but everytime i'm using the installous4.4.2 it suddenly crash and i lose everything i was doing in the installous (like downloads). I've tried everything and still crashing for me =/.....if anyone could help me, thanks a lot. Thanks a lot for appreciation. The next version of Installous will be out in a very short time. and ‘Manual’ carrier mode since you may still encounter the same issue while you are in ‘Manual’ carrier mode. Just switch them vice versa.. Method 6 Works well for me! !